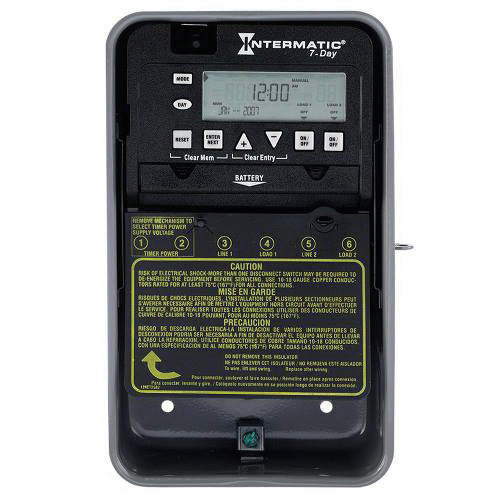 Intermatic ET1100 Series 1-Pole 2-Circuit Basic electronic control with 7-day timing, has voltage rating of 120/208 - 277-Volt AC at 50/60-Hz. It has a dimension of 5.125-Inch x 3.4375-Inch x 7.875-Inch. This electronic control has current rating of 30-Amps at 120/240-Volt AC for resistive/inductive, 20-Amps at 120 - 277-Volt AC for magnetic ballast and 5-Amps at 120 - 240-Volt AC for tungsten. It has contact rating of 30-Amps at 120/240-Volt AC for resistive and inductive, 5-Amps at 120 - 277-Volt AC for tungsten, 20-Amps at 120 - 277-Volt AC for magnetic ballast, 1 hp motor at 120-Volt AC and 2 hp motor at 240-Volt AC. This gray colored electronic control with ON/OFF action, features drawn steel construction, SPST contact configuration and includes NEMA type-1 enclosure. It has maximum load capacity of 1 hp motor at 120-Volt AC and 2 hp motor at 240-Volt AC. This snap-in mountable electronic control accommodates conductor of size 18 - 10-AWG. It has temperature rating of -40 to 40 deg C. This electronic control is suitable for interior lighting, exterior lighting, electric pumps, electric motor control and various other electrical loads. Electronic control is cCSAus listed and California Title 24 compliant.